When a kelpie called Ted fetched $9000 at auction last year, it broke the Australian record and cemented the status of working dogs as a critical plank of the rural workforce. Ted's owner, Nigel Kerin, who runs a sheep stud at Yeoval, said the two-year-old kelpie was worth every cent with the labour efficiencies he brought to the farm. The record was smashed again this year when a dog sold for $12,000. The deficit has driven a tenfold rise in the average price of working dogs at auction over the past 15 years, and prompted a University of Sydney study to determine the most desirable traits and how to breed them to create farm ''super dogs''. Paul McGreevy, the study leader, said it would help sheep and cattle graziers make the best the use of dogs and eventually increase productivity. Researchers will develop a breeding program after identifying DNA sequences associated with traits that make the best farm dogs. A litter could be swabbed to reveal which puppies had the most promising genes, and findings used to match dog personality types to individual farmers, Professor McGreevy said. Initial surveys of farmers suggested boldness, optimism, perseverance and mustering behaviour such as eye contact, stalking and caution were among the most prized traits. 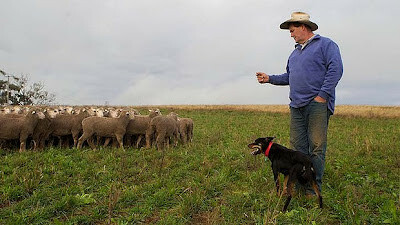 According to Mr Kerin, his dog Ted is like the Cadel Evans of the kelpie world with the ability to do anything by himself, from three-sheep mustering to 3000 in a mob, he can bring them in, draft them, drench them. Go Ted!